Tim thanking all the teachers and students for being here today, and for sharing their experiences in the classroom. My classes weren’t ever like this… guess I needed an iPad in school. Showing kids using iPads to learning about gravity, with elements of comedy. Looks like we’re near the end today. “This is an important day for Apple,” Tim says. 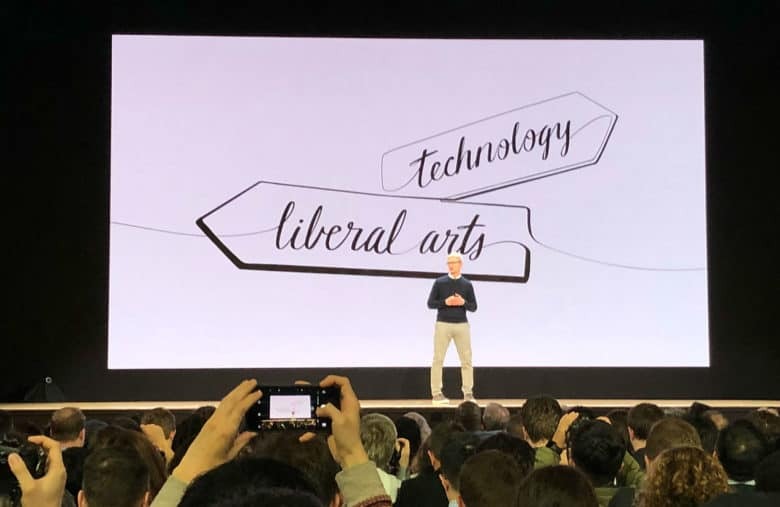 This is Apple’s sweet spot — the place where technology and the liberal arts intersect. Apps, Skills, and Curriculum are the cornerstone of their push into education. The Everyone Can Create preview lands today, with more coming this summer. Allows students to use creative tools to share their thoughts, ideas, or feelings. 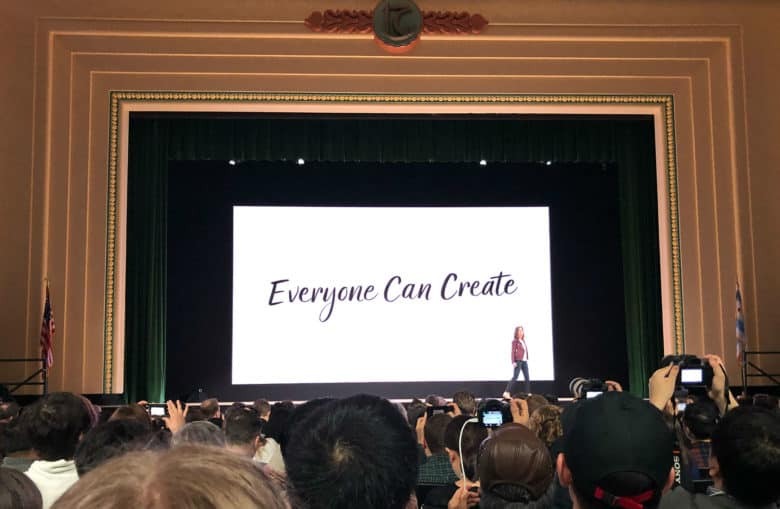 Today, Apple is unveiling new curriculum — “Everyone Can Create” to run along with Everyone Can Code. Highlighting a student that was very shy, and how Swift Playgrounds helped her open up to others and become more extroverted – Coding… it’s practically magic. Introduced students to Swift Playgrounds to show how much could be done with code. Discussing her start in coding with block based coding. Now, a new AR technology in swift to allow kids to learn to make AR apps. Swift is the fastest growing programming languages, designed to be easy to teach and easy to learn. Coding teaching critical thinking and problem solving. Susan back up, discussing building curriculum and coding in schools. Now on stage, Nikole Blanchard of Dunham schools, to share how teachers have embraced Apple Teacher to utilize technology in the classroom. Apple Teacher is a tool for teachers to build technology skills and develop new teaching ideas. Schoolwork will also become available in June. It will totally be ready for the 2018 school year! and of course – Schoolwork keeps all student data private. Schoolwork will allow teachers to tailor their teaching to the needs of students by understanding what students are struggling with. Schoolwork can also check students progress, making it easy to see if students have done their work. Schoolwork can point students to Apps, assign specific activities within an App, and students will be taken there automatically. allows teachers to give handouts, assignments, and apps to their students. But teachers also love their Mac, so today, Classroom is coming to the Mac. Teachers love it because they can see what students are doing, and can even click in and see what a student is doing in real time. Now on to Susan Prescott to discuss teacher initiatives. Logitech gets a mention, too, with the company’s new Crayon – a $49 stylus like Apple Pencil. New iCloud storage for ALL!!!! What was 5GB/account is now 200GB!!! EVERYBODY GETS MORE STORAGE! School Manager tool getting a huge update, too – can now set up 1,500 accounts in a minute. Now on to “Shared iPad” for schools. Students log in and all their apps, settings and documents are available in less than a minute. 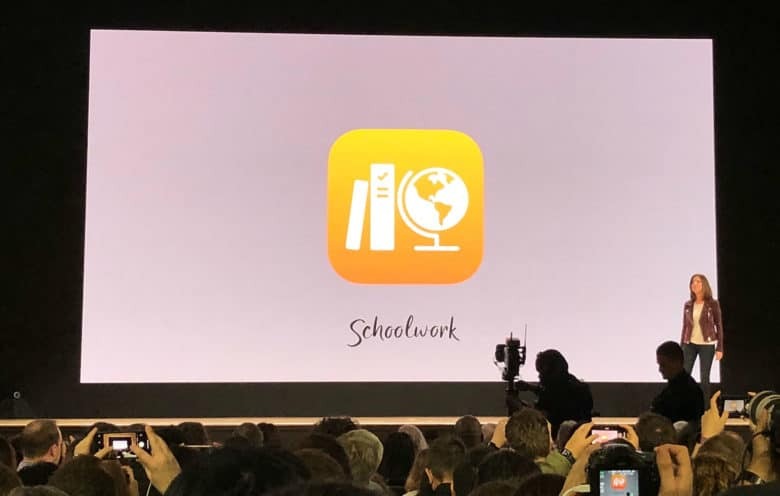 New education features for iWork apps are coming today, along with updates for GarageBand and Clips. new iPad price is the same $329 (or $299 for schools). That’s good for the frog, I suppose. 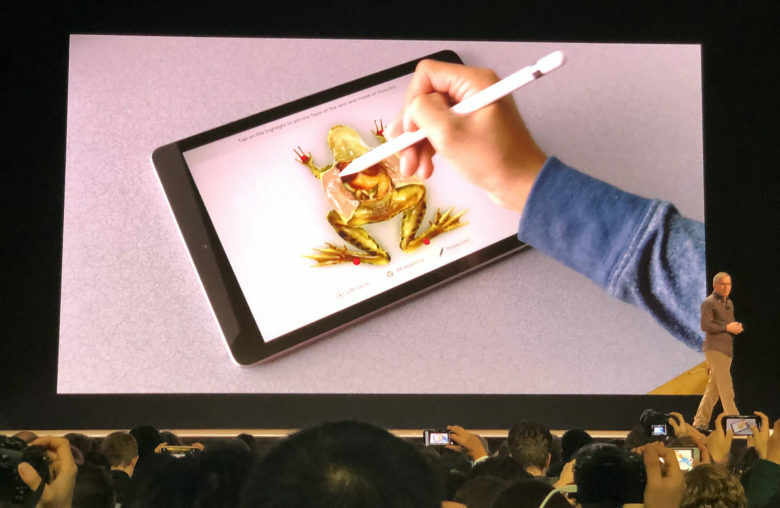 Now into a science app – a virtual Frog app, allowing you to dissect a frog with Apple Pencil on iPad. No stinky formaldehyde needed! Now highlighting AR capabilities – Boulevard AR allows students to view a piece of artwork, in AR, right in their classroom. the New iPad is more powerful that most PC Laptops, and virtually every Chromebook. ? This will enable teachers or students to use the same tool they’re using in class, and create digital books. Now on to Digital Books, highlighting interactive models and features. There’s a new feature coming to Pages (we’re just getting a sneak peak today). 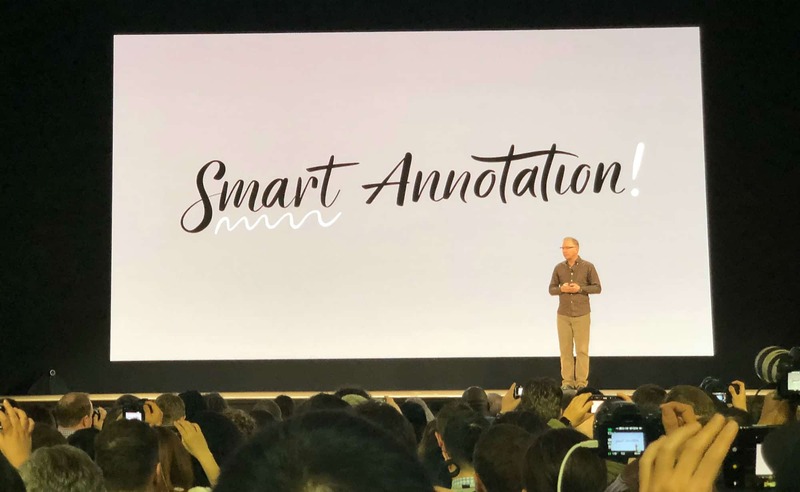 It’s called Smart Annotations, and it allows for marking up a document. 3 of the most popular iPad apps in education are Pages, Keynote, and Numbers – and today they’re getting updated with Apple Pencil support. 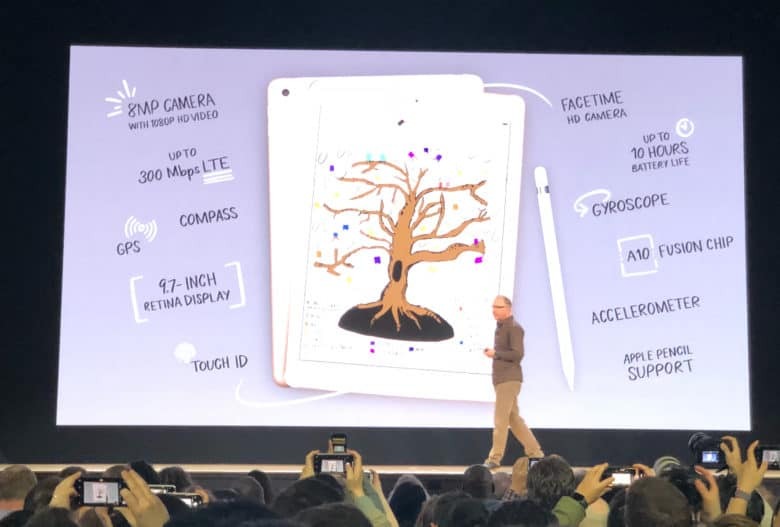 Ultra-low latency and all the bells and whistles you’d expect from an iPad with Apple Pencil. 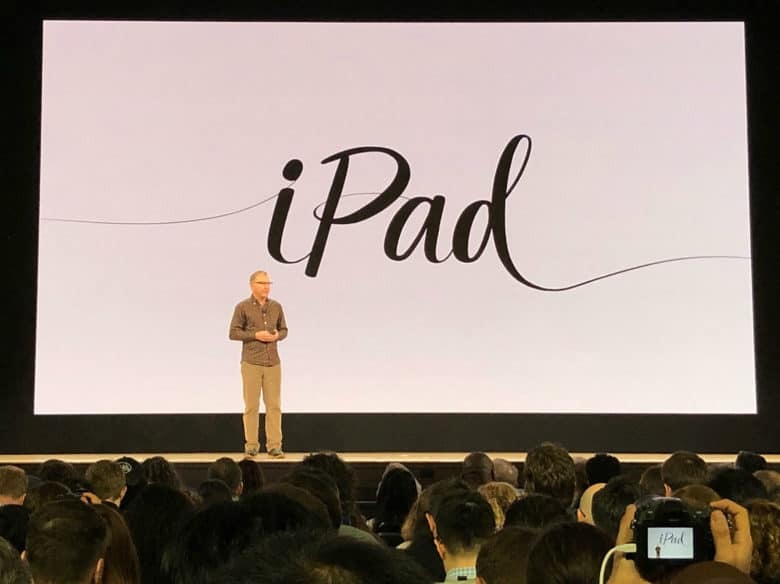 New iPad takes what everyone loved about Apple’s most popular iPad and makes it better, with Apple Pencil support. And we’re into a video, showing a LOT of Apple Pencil. The most popular iPad has been the 9.7″ iPad and today we’re getting an update! Kids are using iPad to discover the process of how food makes it from farm to table, with a look at logistics and processing. Cassey Williams (an school instructor from London) is up on stage now to discuss how they are using iPad in the classroom. There are over 200,000 apps made for education! Kids also love iPad because it’s super powerful. They can shoot video and instantly analyze for speed, force, and motion. Now Tim is highlighting how schools are using iPad for teaching programming, art, and music around the world. Kathleen shared a very inspiring story of a school in Tennessee embracing technology to teach students that would have been otherwise without. The ConnectED program is bringing technology to over 100 under-served schools in the country. 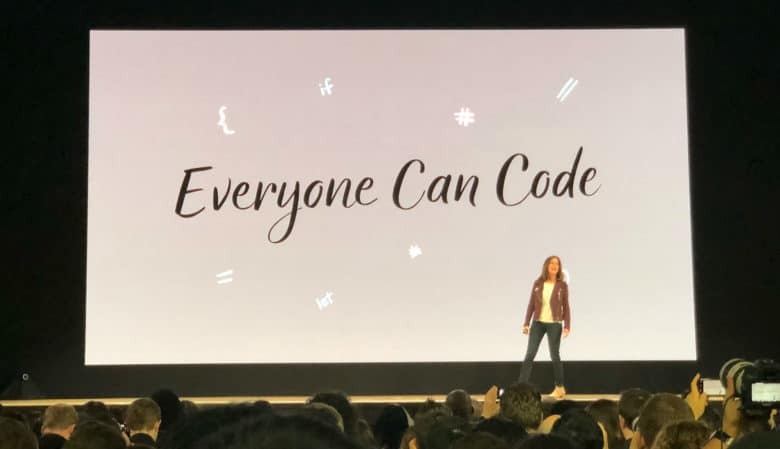 Highlighting the “Everyone Can Code” initiative, and Swift Playgrounds, Apple’s gamified iPad app for learning its Swift programming language. 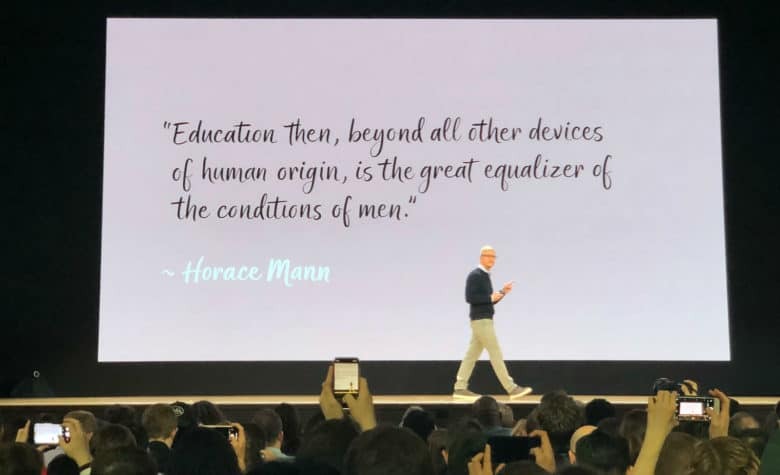 Apple remains committed to focusing on education, and to teaching educators to use technology in the classroom, Tim says. Lane Tech has more students getting PhDs than any other school in the country. Tim highlights the importance of computers and technology in the classroom, including Apple’s recent partnership with Chicago Public Schools. “Chicago is one of the most forward-thinking school systems in the nation,” Tim says. Tim takes a moment to recognize all the student marches across the nation this past weekend calling for stronger gun control. 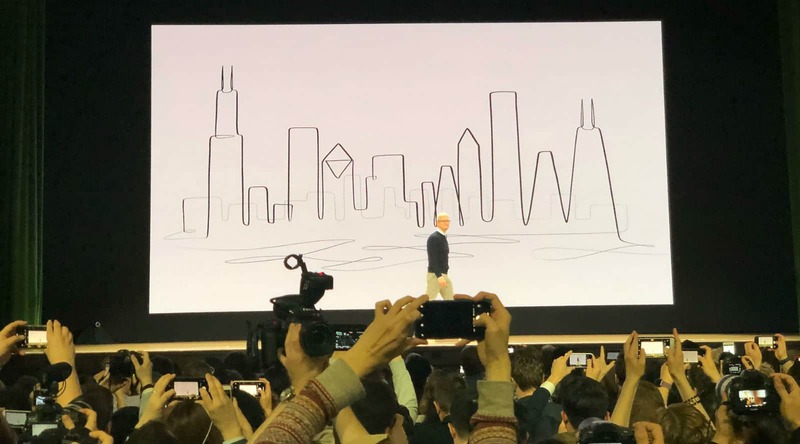 And Tim Cook is out onstage! Starting with a video of kids playing on a playground. The lights are out, it’s go time! A quick peek at Al Gore before we get rolling. Announcement that we are about to begin. Buckle up, everybody! Holy Moly! 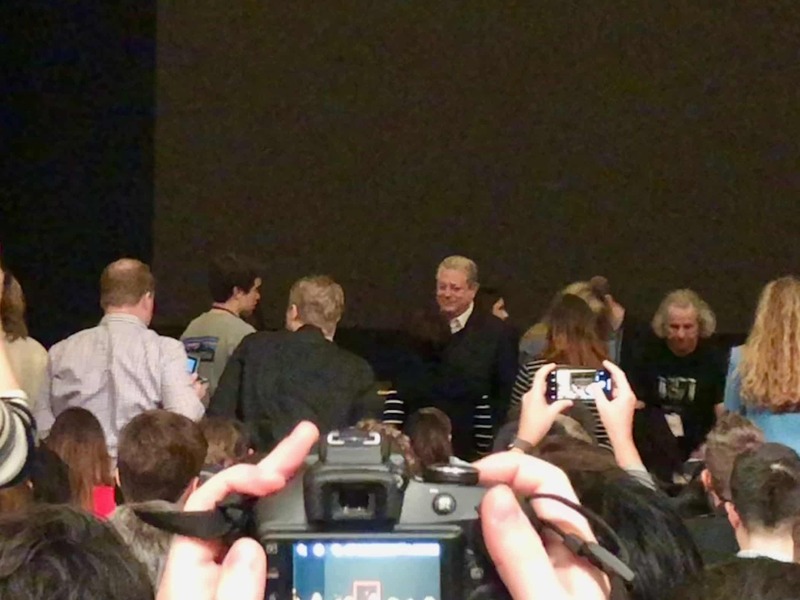 Al Gore is here. Apple employees coaching the crowd to cheer. Something exciting HAS to be coming, right? Lots of students in attendance at today’s event. True dedication to come in over Spring Break. That auditorium looks tiny for an Apple event! This auditorium is really nice! Great venue for the event. 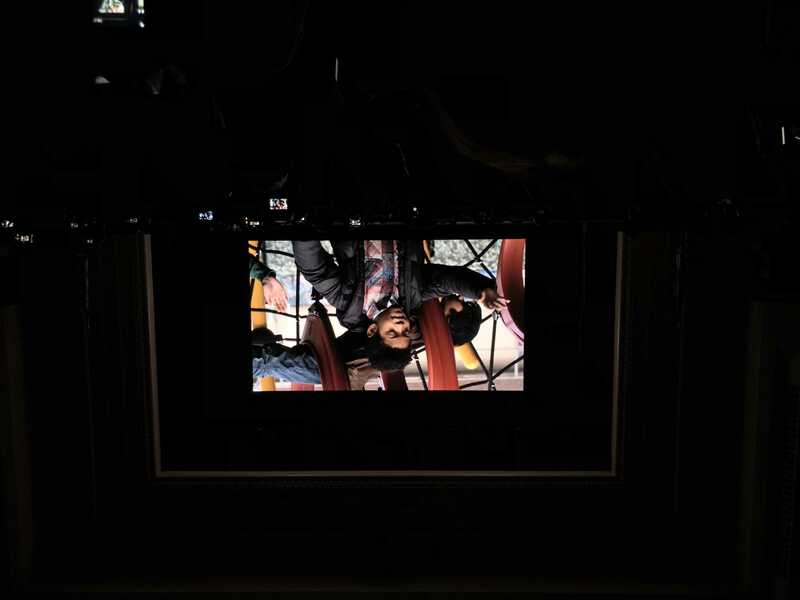 And we’re in the auditorium. And we are headed into the auditorium. 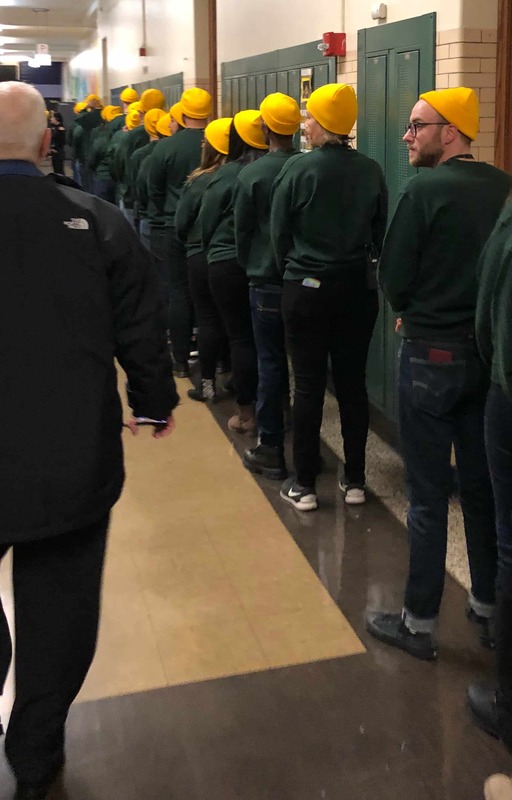 Tim Cook has a staff of minions lining the hallway…. Press area is getting pretty full. They tell us we start Orientation at 9 … because school. Here’s Ian’s class schedule for today while at the event. The press are inside the school and tabling up to the breakfast table. Just over an hour until showtime. The fact that Apple’s online store went down this morning is a big clue that we really will see new products during today’s event. A cheaper iPad is the most probable addition, but maybe Tim Cook has something up else up his sleeve. It’s early, but we are here and in line, folks. Lots of school employees here. How does Cupertino plan to reshape the classroom of the future? ClassKit, the Apple educational framework we expect to see unveiled tomorrow. 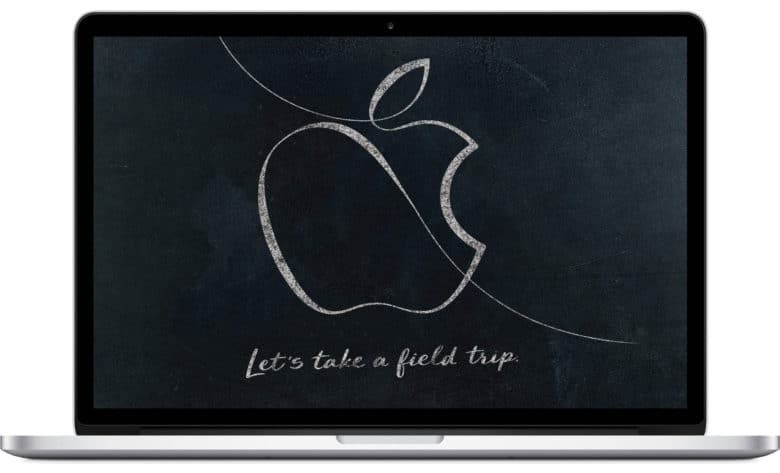 Here’s a little extracurricular reading to do prior to the presentation: What to expect from Apple’s big “field trip” event. Get the scoop on expected new Apple hardware and software.